Blurb: A tidal wave of reform is sweeping across the Middle East. Many lurk in the shadows, eager to seize power – giants of a vast criminal underworld, fueled by revenge and vengeance. Their wars know no end. Their power knows no bounds. At the center of it all are two men who are inches away from holding the world in their hands: one is known as Dyadya Gourdjiev, and the other is known only as the Syrian. Department of Defense special agent Jack McClure has followed a trail of shadows and lies right into the arms of Gourdjiev’s alluring, powerful granddaughter, Annika Dementieva. The lovers are in Moscow when news of Dyadya’s failing health draws a slew of vultures – circling, anxious to seize the empire of secrets he spent a lifetime building. Jack and Annika find themselves locked in battle to ensure his safety … but when it comes to Dyadya, nothing is as it seems. Alli Carson, the child of a dead U.S. president, has become Jack’s surrogate daughter. While Jack is in Russia, Alli is targeted by a cyberstalker who knows more about her than anyone should. With no one to trust but her friend Vera Bard, Alli is determined to discover the truth, but her path forces her to come face-to-face with the nightmarish terror of her past. As these two stories play out, Secretary of Defense Dennis Paull, with the help of detectives Nona Heroe and Alan Fraine, follows a trail of lies, corruption, and secret pacts that begins with Washington, D.C.’s head of detectives. All paths collide at the feet of one man, an old legend adapting to an ever-changing landscape … a man history might have forsaken, but whose heinous evil is still very much alive: Father Night. Review: I have to start by saying that this is the fourth book in the Jack McClure series. However, I need to let you know that it also stands well on its own. I had absolutely no trouble following the characters, because Mr. Van Lustbader does an excellent job of filling in the backstory (and doesn’t take a gazillion pages to do so, either). Character development is what really makes or breaks a book for me. And I enjoyed all the characters in this book. However, I really took to Alli’s character. There was just something about her that really drew me to her. She was likeable. She had “baggage” and yet she wasn’t bogged down by that baggage too badly. I felt for her in regards to what had happened in her past – and I think that that’s really what shaped her into such a great character. 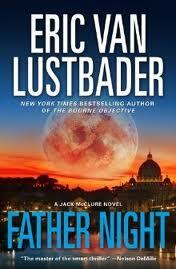 I have never read a book by Eric Van Lustbader before – but this definitely won’t be my last time reading him. (Hey, he must be a good author if Robert Ludlum’s estate picked him to continue the Bourne books!). Reading this book really made me want to go back and read the first three books in this series so that I could really understand everything the way the author intended (but as I said above, not having read the earlier books in no ways hampers the reader’s ability to follow this book). Overall – if you enjoy a thrilling, fast-paced adventure – I would highly recommend giving this book a shot. * I received this book courtesy of Anne Staszalek, Marketing Associate for AuthorsOnTheWeb, in exchange for my honest opinion. I received no monetary compensation.